This weekend was jam-packed with win and goodness and I mean jam-packed. Friday was one of those TGIF days since work was extra workie and I had such a weekend to look forward to. We went up to our friends house for our ‘normal’ Friday night and this was double special because we have not seen them in 3 weeks due to travel, and, Lars made a yummy pulled pork for us all so we put Zoe to bed in the pack-n-play and Niamh played like a doll and we had an adult dinner with our friends. Saturday we were invited to two different parties that semi overlapped but we figured out how to do it all – a rare instance where it was actually possible. We did a normal morning then naps with both girls actually sleeping at the same time. Woke up fresh for a POOL party that was a huge success. We were technically late since swimming was from 1-4 with cake at 4 and we got there at 2ish but for 2 little squirmbots an hour of swimming is plenty. The party was at shoreview community center and it was more than a pool since it had cool floating islands, a kids slide and mini park section and a big water slide that according to Lars (I can not be bribed, shamed, or paid to go on one of those) was very fun. He loves them though and was so happy that there was one that I held onto both girls while he went up. While I was bobbing and restraining one jumper (Zoe) and avoiding strangulation (Niamh) and happily chatting to friend mom’s there I heard the “I am Iron Man” song in the play list and thought “wow, odd music all of a sudden, too bad Lars is missing it” and then he comes over – apparently he got to choose the music he slid too and that was his choice, do I know him or what. Anyway…. Cake and presents went well, the gift we choose seemed good. The birthday girl is along the lines of a cousin but we are not actually related. I’ve never been one to be the ‘you’re my new family’ type of person but in most ways the core team of guys Lars works and works out with are like family, the guys are like brother in laws, their wives sister in laws and their kids are my kids cousins. (sorry this is very tangential today). Post cake we scooted when the bigger kids when back to swim more and got going to party number two. Party II was a going away party for the friend who has been keeping house for us for a year. We will miss her in general but she just has been such a part of our life that we will miss her extra. Her party was a little frustrating to get to because Garmin led us astray but we called a friend who is the Rain Man of directions and he got us there. We spent a nice hour or so hanging out and saying goodbye over hotdogs and yummy desserts. I’ll see her on line and on FB so I don’t consider her gone forever, just living somewhere else. Both kids fell asleep in the car and we transferred them to bed without problems. Lars and I watched a ton of Brotherhood2.0 and then to bed. Sunday was a banner day for our garage; the Regalia is LEAVING the building! I’ve enjoyed helping with the job, I don’t feel like I did enough and I’m relieved to not be on the hook anymore. It was a great visit with two friends, one who is getting the stuff and the other to help/manage. I felt it the next morning since some of those suckers are heavy and I was contoured on a ladder to get the stuff. Remember this pic? Well that was Lars putting the stuff up there, imagine me doing the same but taking it all down… So now I have nice extra space and I have to decide what to put up where! Sad what is exciting to me. The rest of Sunday was misc stuff around the house and shopping and the general living of life. What you have all been waiting for, a diaper update! I’m so far getting less enamored rather than more. Niamh I think we need to move back to pullups, she is distinctly damp in the morning and since she likes to spend at least 10min in my bed every morning (often more) that is too much pee dampness in my bed. It might be that she goes too much, it might be that the fit is odd so she scrunches the absorbent material to a position that it does not catch it all but DAMPNESS! So pullups again for #1. Zoe either might be a tad big for the mediums, or, I need to get better at the putting on technique but she was very minorly damp this morning for the first time and I noticed that the soaker was scrunched on her too this time. I’m still going to go with Zoe and work on my technique but I think Niamh is done for the moment. Looking ahead, the potty training was made much easier by the difference between a pullup and a diaper and getting a pullup was a ‘big girl’ thing. If we are all cloth that threat to ‘go back to diapers’ is gone and the treat of a new pullup is too. Oh well, no huge issue and hopefully soon Niamh will be dry all night anyway. The big test will be when we visit NY next week, I plan on bringing all our cloth and a few regular ones too. This weekend will actually be the first 2 day stretch with them so I might change my mind about next week by Monday but hopefully not. In other exciting news, we are interviewing for a new housekeeper person, our soon-to-be-former one is going to grad school far far away! Hopefully the person we are interviewing this afternoon will be a fair replacement, if not, back to the care.com well. I think this time the interview will be easier because I know far more what I want done and not done. This weekend will be another busy one – Saturday is a going away party and Sunday is the day I’m handing over all the regalia to a new volunteer. It will be very nice to have all that space back but I’ll miss the minor involvement it gave me. Maybe I’ll do it again someday… without (needy) kids I would do far more then what I did this round; I had a whole list of little projects but they got moved to the bottom of the to-do list when kids were born. Ps. Almost forgot about Dexter! He is very well and shows no ill effects from the visit. The vet tech’s said he was ‘crazy’ and ‘fun’ so we are no validated in our opinion of his extra high energy levels. July, originally uploaded by katymac79. This weeks challenge is to post a picture of a pet, something that anyone who has tried to do and gotten shots of demon devil cat knows isn’t easy. Little Dexter, as we speak, is undergoing a slight *alteration* to his body at the vet – as in certain bits have got to go! He is a feisty little boy and while very very loving overall his energy is a little out of hand. Also, his claws…. There are limits to my behavior modification patience and this boy is not getting it! Yesterday I tried to get a picture of him in the bath tub up to his kitty knees in water thinking it was no big deal. I missed the shot because Zoe pulled up the shower head button and Dexter apparently has his limits with water and a shower to the face is it. More on this bath later…. 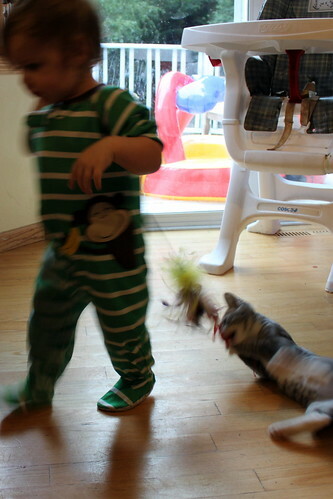 Anyway, this picture is a small dose of what he is like and he and Zoe play all the time. This toy is his favorite and I have a ton of pictures where there are hardly in the frame at all they move so fast. If you look at the flicker stream there are many others including a cute one of Zoe holding Dexter like a rag-doll but I’m officially submitting this one because I just like the art quality of it and the little stinker is on my mind. Cloth diaper girls, originally uploaded by katymac79. I tend to plan to the level of analysis paralysis and Lars tends to not really plan – together we do ok. This weekend there was a ‘sample’ person at costco with Cutey Baby, a new brand, cloth diapers and I’ve been looking at the idea for a while and I have done some research the ton of options always made me pause. With a real example in front of us and knowing that the price was very good ( 6 for $100) we just decided to jump. Technically Lars decided, I dithered. Anyway we left with 4 large ones for Niamh and 8 medium for Zoe. We still need to figure out the logistics of it all but so far so good. I washed them all as directed and they all velcroed together into a huge mass of diaper. Pulling them apart made some of the liners pill/pull already – is there a way around this? so next week we will have a weekend under our belts and maybe more to say on the subject but hopefully this is step toward wasting less. At one time in life the nightlife of Pennsic was my reason to wake up but somewhere the masses of sweaty humanity lost its appeal. Maybe around the time that I found the guy I wanted to find, all the others were just sweaty people…. This year the allure of the night life was mostly to see friends but once we got bed time routine down it was the first time in over a year that Lars and I went anywhere alone together because my parents could be there if there was an issue. Zoe, once asleep was reasonably easy to keep that way and there was only one Nuk issue once that had dad come look for me and that was mostly because a knighting that should have taken 20min took 2 hours (court was long, then it was long). One of the other nice evenings was seeing one of Lars’s best friend and an old friend of mine get engaged. It was surreal in some ways but focusing on the happy is far more productive in life. Another nice evening out was the Bloodguard Ladies night out where we all met up and tromped around pennsic together and finished at an awesome Ladies only party. We played a drinking game that we had to take a sip anytime someone said ‘Your Grace’ and with two duchesses in the group that was alot of times. The guys ‘crashed’ the ladies party around 11:30 and Konrad actually got in first and we thought he was alone and we almost got him bounced out of the party then the other guys appeared and the look of fear and panic disappeared. In between we tried going to some of the BIG parties and usually bailed on them because they were too crowded or too dull, most of the fun was wandering around with people and running into others. The midnight madness was the one exception where the crowd was the fun – the whole market stays open to midnight and everyone is out and about. Very hard to really shop but great for running into people you don’t see other times. It was the same night as the super long knighting so we didn’t even get out there until 10 but it was a fun time to see and be seen. Lars still wants the stay out all night nights but I’m good until about midnight. By then my feet hurt from the miles a day of walking and I know the kiddies will be up at 7 no matter what. This year iPhone movies were the Niamh lifesaver, she watched Mulan every night but it kept her happy. Zoe took a few nights to get used to the world and she would NOT just go to sleep on her own. I wore her to may parties and by the end of them my feet hurt extra from the 20lb of baby I was hauling up a big hill or two but when she nursed to sleep asleep she stayed like a tiny miracle. Thankfully once we got home she was fine to go back to her go to sleep alone routine in her crib no problems. All in all the nights were good but it felt like we were always missing something because there are just too many parties going on. During the day I’m choosing not to fight or go to classes but I don’t mind missing them and I don’t try to go to any so there is no feeling of ‘not making it’ like there is when we are just too pooped to go to a party cross camp! So this ends the at pennsic recap, all thats left is the journey home for tomorrow – Pennsic part 4. To all the not SCA people who read me sorry for the semi inside jokes but if you want to learn more about the SCA in general go to SCA.org – its international! Well… mostly, for the 2 people who are reading in Brazil (very loyal according to my stat counter) lá isn’ t ESCUMALHAS para baixo lá (contudo).